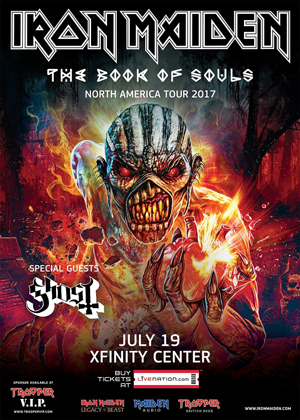 Throughout the night of July 19th, it was a 90 degree sweatbox at the Xfinity Center ampitheater, the weather seeming to be trying to outdo the concentrated heat and fire that is an IRON MAIDEN concert. Spoiler Alert...it failed. But more on that in a minute. This concert was another first of sorts for me. I had seen IRON MAIDEN in concert twice before, but this would be the first time I'd see them on tour for a studio album as opposed to a greatest hits tour. Of course this meant I'd get to see songs from the band's The Book Of Souls album in a live setting and considering how much I liked the album, this was a big thing for me. Skipping the process of parking at the venue (which I heard a rumor took some people three hours to get out of at the end of the night), I parked about a 15 minute walk away and headed towards the entrance gates. Now, maybe I just haven't paid attention, but can anyone tell me when they started putting a concession stand for the T-shirts outside of the gates? Hell, you could buy a shirt and not even have to buy a ticket to the show! I waited until I got inside the gates before grabbing up a couple of shirts to add to my own MAIDEN T-shirt collection. As I'm sure most people following the tour know, the band GHOST opened up. I've never been a fan of the band. I found what little music I'd heard from them thoroughly uninteresting and the whole Papa Emeritus and the Nameless Ghouls thing a bit of a bore. But a funny thing happened when I saw them live...they actually came off pretty good. Well, when the music was playing at least. In a live setting, the band's music felt more rhythmically interesting and I actually found myself "banging" my head in enjoyment of what I was listening to. I had to look up the set list below since I really had no concept of the individual songs but judging on how they sounded on this night, a reconsideration of the music might just have to be done. Of course, that being said I had a HUGE problem with frontman Papa Emeritus. No, not the whole demonic pope or carnival barker Vegas showman once the robes disappear but rather the obsessive preening. Yes, as he tried to come off as cajoling and hyping up the crowd, I found his stage presence (when not actually singing) to be intensely off putting. It felt like he was begging the crowd to "Like Me...Like Me Please!" I don't know if it is part of the act, but I was thoroughly turned off by it. Still that annoyance aside, I stand by my assertion that I really enjoyed the band's set otherwise. After a relatively brief intermission where I spent most of my time cataloging the various band T-shirts on display, (While I was flying the KNAC.COM flag with my shirt, I saw stuff ranging from Nina Hagen and Joy Division to METALLICA and MANOWAR plus about 100 different IRON MAIDEN designs), the strains of MAIDEN's lead up song "Doctor Doctor" came over the loudspeakers amping up the crowd as the main reason the sold out 20,000 souls were gathered on this night hit the stage! And after a great animated bit over the two giant video screens on either side of the stage finished, hit the stage IRON MAIDEN did. With malice on their mind, the band took full control from the first note and kept that control up until the final notes to sweat soaked but fully sated hours later. It was a mostly masterful performance and I don't say that lightly. The last time I saw IRON MAIDEN, there were a lot of sound issues (at this same venue as a matter of fact) and it put a damper on the show a bit. But as they opened with "If Eternity Should Fail", the first of six songs from the latest CD featured in the set list, the past was forgotten and replaced with this new instantly great memory. The energy MAIDEN puts forth so deep into their career puts bands in their 20's to shame. With Bruce Dickinson running about the entirety of the band's massive stage set, the rest of the band holds down the main portion of the stage, stalking foot by foot and engaging the crowd. Janick Gers windmilling on guitar, Steve Harris stalking, stomping and staking out his performance with a fury and both Dave Murray and Adrian Smith providing one fiery lick after another while looking as if they were unruffled by the mayhem around them. And I just love Nicko McBrain's work on the drums (even if it did look like he was being punished by where his set was located within the staging itself). It was such a mesmerizing performance, you forgot just how hot the weather was. One of the things I like about a MAIDEN show is how you are encouraged to play along with the handclapping, arms swaying and singing along. At other shows, you might (as I sometimes do) feel a little self-conscious at playing along. But there I was, along with everyone else screaming out "Wrathchild" or "Iron Maiden" during each song's chorus, reciting the opening intro to "The Number Of The Beast" and just cutting loose in joyful exhultation! It also helps that as a frontman, Dickinson knows the difference being exhorting a crowd and not preening to it. I've seen some reviews that made mention of the inclusion of "The Red And The Black" as a low point in the show. I was curious about this because I actually like the song. As I said in my review of The Book Of Souls CD, the song ended up being good for the most part but it did get bogged down and went on a bit too long. It is almost like they just couldn't figure out how to end the song. The one thing I noticed that tended to affect my enjoyment of the show a bit was how at times throughout the show it seemed as if Bruce Dickinson's vocal just dropped out of the sound for a couple of seconds. I'm chalking it up to a problem with the microphone because during the encore, he ended up throwing down the mic and getting a new one because it finally just seemed to die. I know there's no way to satisfy such a large fanbase and play every song they want to hear but I really like how MAIDEN goes out on these studio album tours and promotes that current album instead of just playing 1 or 2 songs. Naturally this leads to me hearing some idiot in the crowd behind me screaming "Play some old stuff! ", but that was a very small minority of the crowd I think. The day after the show, videos taken by fans popped up on Youtube and I managed to find 12 of the 15 song set list represented. I can't wait to put them in order and relive the show again. IRON MAIDEN hit all the right notes in the set list I believe, the new songs mostly mixing quite nicely with the classic material and providing a 2 hour soundtrack that taken as a whole won't soon be forgotten. I've been riding the fan bandwagon for MAIDEN for more than 30 years and not one of those years has been a "wasted" one. The band is a standard bearer for all things heavy metal for a reason and their "The Book Of Souls" tour stop in Mansfield only served to both reinforce and enhance that standing. "The Red And The Black"